A fluid-filled layer between dial and sapphire? Time indication aided by magnets? Caseback setting and winding? 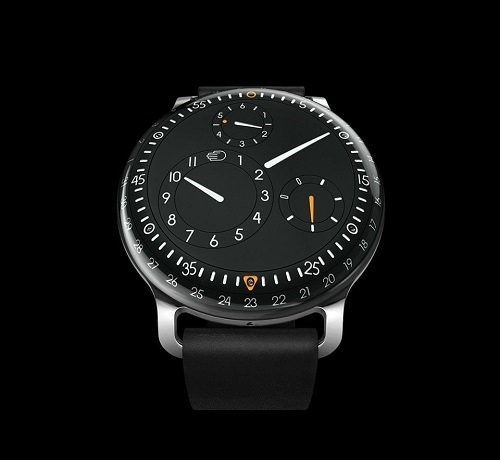 I challenge you not to be impressed by the new Ressence Type 3 watch. This timepiece defies traditional watchmaking with its faux-mechanical appearance, yet it is in fact as calibre-powered as they come. But - it has, as you would imagine, a few unconventional and noteworthy features. 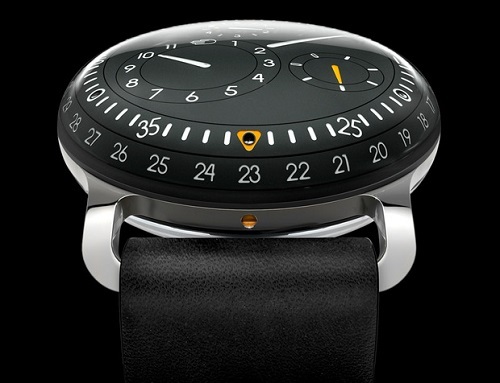 Ressence are already well known for their virtiginous satellite-style dial indications. The Type 3 adds an illusory quality to their portfolio for 2013, with indications which do not simply orbit, but also seem to rise up so far as to reach right up to the top of the sapphire which appears to be hardly able to restrain them from floating upward - indications which don't just reach to the edge of the dial, rather they tip right over its rim. Reminiscent of a bubble compass panorama, I do believe that hours will be lost during Basel World 2013 while on-lookers become lost and somewhat mesmerised by its compelling perspective on time. The space between dial and crystal is generally insignificant, in the creation of this watch Ressence have filled it with fluid and that changes everything. The indications seem clearer, are slightly magnified and appear to rise up to tactile dimensions, thus the ability of the eye to refract light is duped - that which is close, is in fact less so. Despite all the new fangled technology used in modern watchmaking, the addition of liquid and the micro mechanics which power this wristwatch are not good bedfellows, so a layer of titanium is employed to separate the two. This throws up another conundrum - how to drive the displays without causing calibre carnage? Magnets offer the solution and are linked up to the movement to make the timekeeping parts do the business ... but - magnets and a mechanical watch are age-old enemies, so their incompatibilities are resolved by encasing the movement in a security blanket of soft iron cage protection. That such minimalist aesthetics are capable of displaying so much information is a feat of accomplished design. The hours, seconds and day of the week each have their own island-like subdials, the minutes are at the dial edge and the date ring is on the outermost edge where you would normally expect some side-on fuzzyness, but of course there is none. Nothing detracts from this perfect roundel, the Type 3 has no crown, and winding and time-setting are enabled via ingenious caseback technology. Turn the piece dial-side up and time-setting is disconnected. Styled to hug the wrist, the curvaceous case measures 44mm and has some rather distinctive open lugs, also angled for comfort, and forming part of the titanium middle case construction. I believe that only live on the wrist glimpses or better even, the experience of first-hand viewing will give this piece the testament it deserves. Until then I affirm, the Ressence Type 3, from its white-on-black indications with the enhancement of vivid orange to its wrap-around beauty and in-built technology is indeed an ingenious watch.